So the football is finally over. Now I can go back to regular, unthemed outfits. Today’s outfit started from this blue, lace edged singlet. It’s a misshop singlet I got many years ago. I totally forgot I had it (and a second one in a different colour) until I went through my singlet draw last week. I was about to give them away because the neckline is a bit low, but I’m glad I didn’t. It’s all a little plain today. 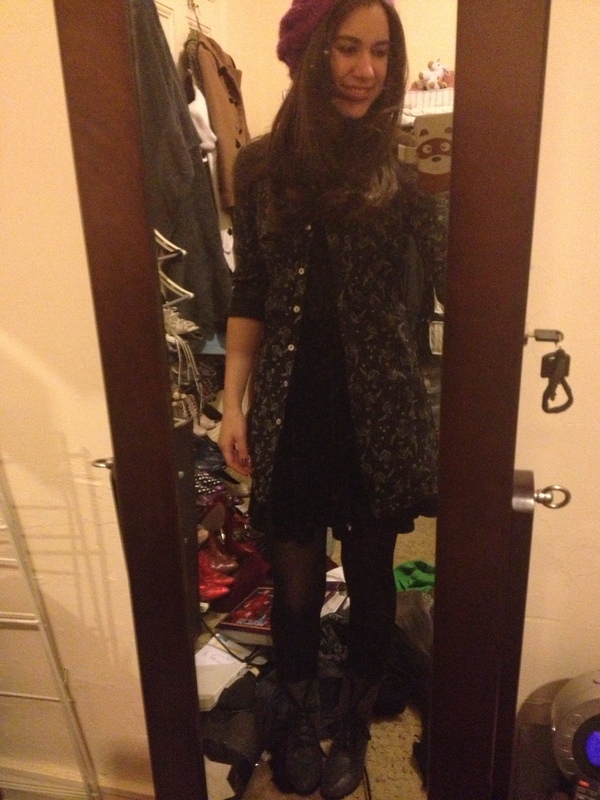 Portmans jacket, grey skirt, black tights and black shoes. As usual I have opted to show a midweek outfit on the weekend. I wore this one out for dinner on Tuesday night. The base is all black. Black velour skater skirt from Supre ($7.50) and just a plain black singlet (honestly, no idea where it’s from). As it was abnormally warm in the city on Tuesday, I didn’t need a heavy jacket, so I went with this oversized shirt instead. You can’t really see it here, but it has little grey ballerinas and little purple stars printed on it. I may seem like I’m contradicting my football decision from yesterday, but you gotta choose a team to support in the grand final and this year I’m going for the dockers! Firstly, because they are the underdogs and secondly, because purple and white look much better than brown and yellow! These cute purple boots were from a shop on Sydney Rd and cost me $40. The shorts were a serious bargain from Myer (only $7.50), but this adorable top is the star of this outfit. It was originally painted by my mum for a costume party. 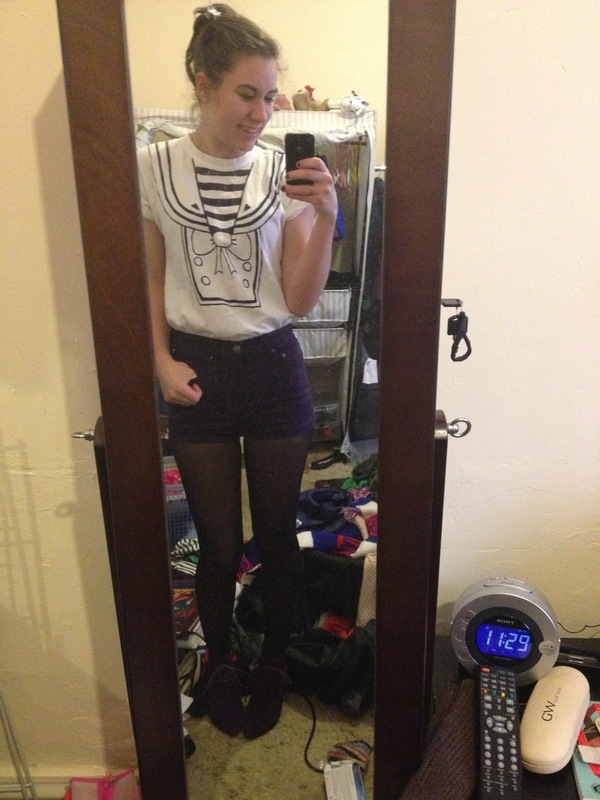 I hope there is a mighty boosh fan reading this who recognises it as Vincent Nior’s future sailors top. It worked its way into my regular wardrobe and now I love it. So they may not have even made it to the finals, but its footy day at work and anyone who knows my family knows we don’t take dress ups lightly. 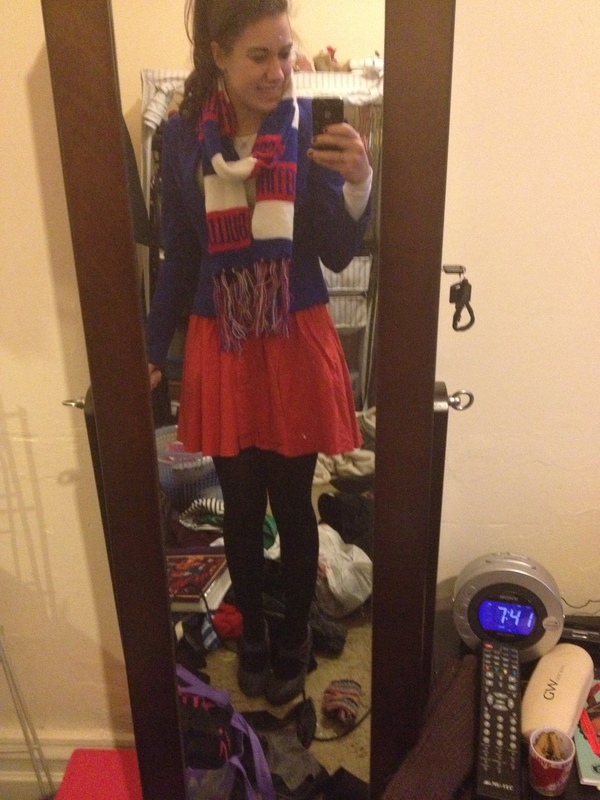 Surprisingly, (without the scarf) this outfit doesn’t look too silly. The skirt was my mum’s when she was my age. Apart from a little fading, it had stood the test of time. It’s especially good in the summer as it is really light and airy. Today isn’t so warm, so I’ve kept my tights on (and my Rivers heels). Well I survived the crowds of Hawks and Freo supporters, so it mustn’t be too bad. Lets hope 2014 is our year! What a cheeky little thing! I do feel a little like a small child in this dress. I had completely forgotten about it til last week and I was worried that with the weather warming up I wouldn’t get to wear it until next winter. Thank goodness I live in Melbourne, where the weather can change in a split second, and just like that it’s 16 degrees and hailing (yes, hailing!). This dress was bought for me by my mum many years ago. I can’t remember where exactly she got it, but I remember her telling me that the lady in the shop said heaps of people had tried it on, but it was always too small. In the past I have worn it with a t-shirt underneath, but I thought I’d full commit to the school girl look and wear my black Misshop shirt. 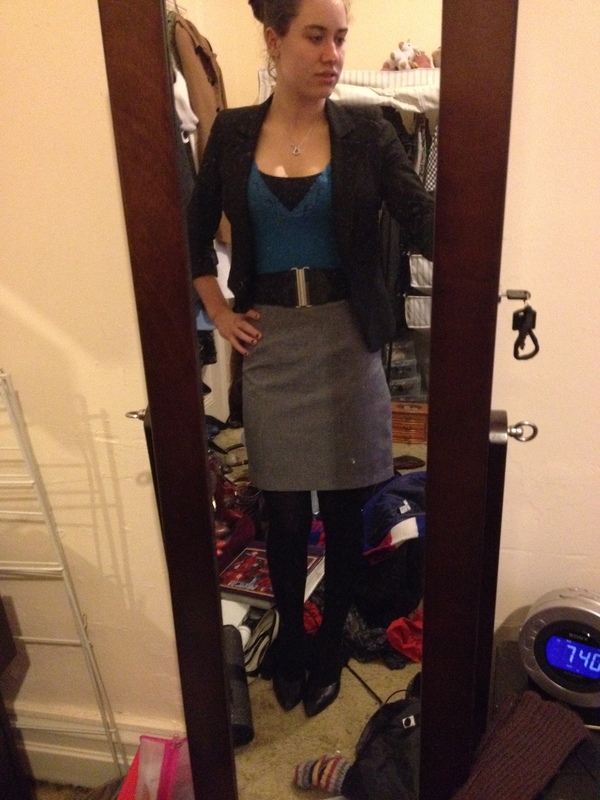 Black cardi, black tights and grey Rivers heels complete the look. P.S. sorry for no post yesterday, but I was bed ridden with illness. I’m feeling very colourful this week. Keep my usual plain black on the bottom half allows me to be a little more crazy on the top today. This Tokito to ($20 from Myer) is extremely comfortable and has a great graphic print. 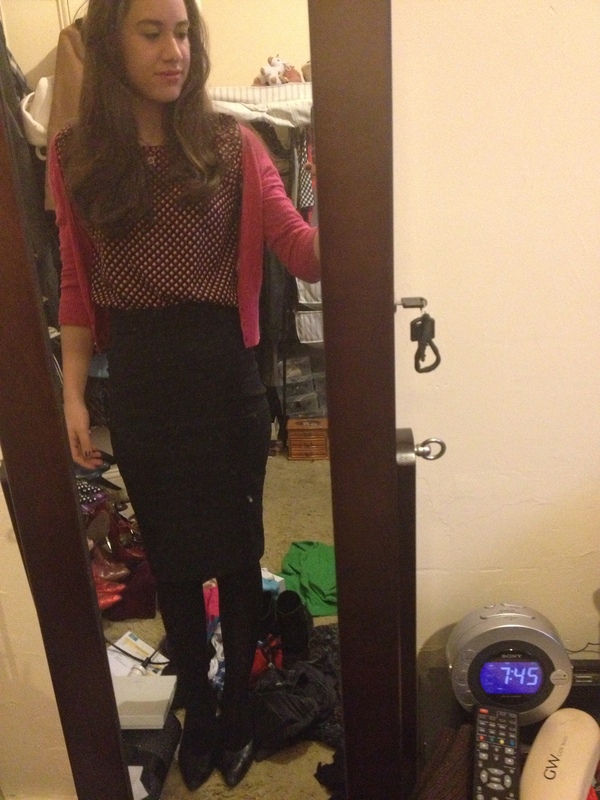 I decided to pick up the pink in the top with this cute cropped cardi (nice alliteration). I got it from Sportsgirl years ago. It is very girly, but it’s the perfect light weight for spring when you want your arms covered but don’t really need much extra warmth. 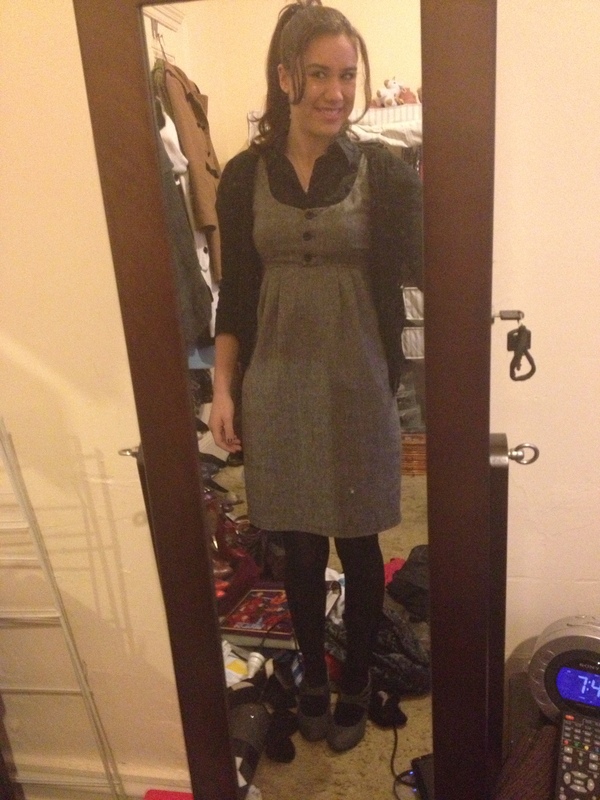 I really love this monochromatic dress ($25 from Portmans). It may hurt your eyes if you stare for too long, but it is very striking. 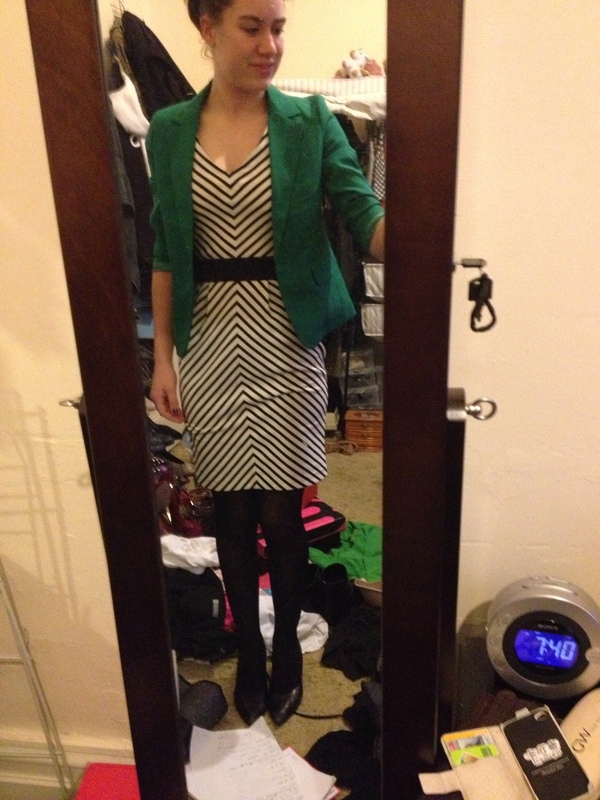 Especially with my green blazer. One of the best features of this dress is the black waist band. This draws attention to a small waist, which is good because stripes are notoriously unflattering. Luckily I was smart enough to wear tights tonight, despite the prediction of a 27 degree day, because it definitely wasnt that warm! (or at least it was very windy).